I had my best track season ever (so far!) in 2009. I was 5th in the World Masters 100 metres and 4th in the 200 metres final in Lahti, Finland, missing the bronze medal in the latter by just two hundredths of a second, as the athlete next to me tripped and fell forward faster than he was running! A lot of work had gone into getting to those races. My blogs eventually came to admit that it was not all good work, because the expectations I’d placed on myself were huge, and I’d been beating myself up physically, and (particularly) mentally. Later, when the work got harder and the results refused to come in the winter of 2010, my slide into clinical depression was as rapid as it was unexpected. The world has come to know that depression is an issue in sport, just as it is elsewhere in real life. I don’t recall us acknowledging that quite so much, even as recently as 2009. Well, I’ve just had my most successful major indoor athletics season since March 2009. Back then, the European Masters Indoors in Ancona, Italy, were a vital part of my build up to the Worlds in Finland that summer. 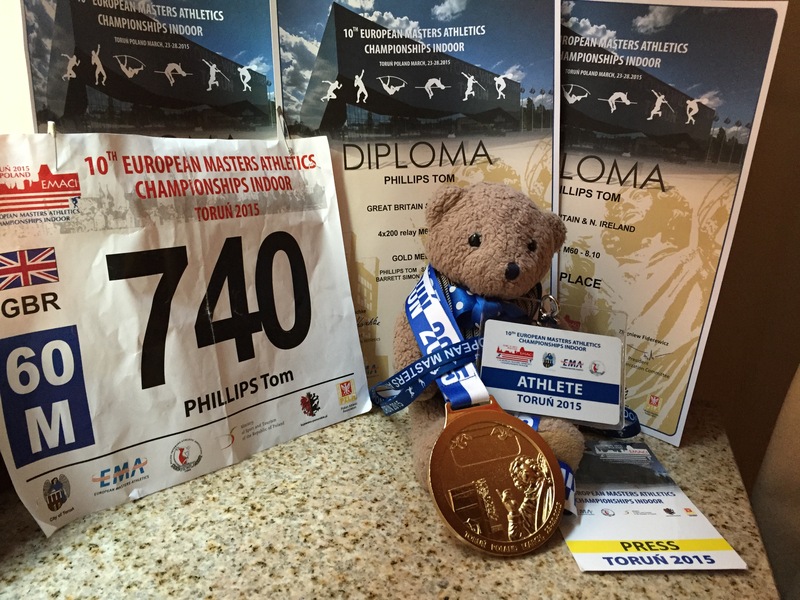 I’m newly back from the 2015 European Masters Indoors in Torun, in Poland. I ran my fastest 60 metres for several years in the heats, made the final, and got 5th place in it, in an even faster time. In the 200 metres heats it all just clicked perfectly into place. I ran my socks off and made the semi-final as second fastest qualifier of 18 top class Masters athletes. My heats time was half a second faster than I’d been running even a few weeks before, despite having had a worrying back problem just before leaving for Poland. Things went even better for me in the semi-final the following morning. Although it was my fourth race in four days, the chiropractic and massage experts of our British Masters Medical Services squad had kept me in great shape. My semi-final time saw me third fastest qualifier for the final in a time I’d never have dreamed of achieving this winter. It was about 2009/10 that I last raced that fast. (Are you spotting a pattern here?) In Finland in the 2009 Worlds, there were several, myself included, I guess, who had just about placed a bronze medal around my neck before the 200 metres final had even begun. This time? Well, maybe once or twice, but I’d arrived at this point more surprised than anything (and anyone) else. I was just wide-eyed with amazement at what I was doing, and loving every hundredth of a second of it. Fifth place in two European Masters finals a few days apart? I’ll take that. I had no idea at all it was remotely in the offing when I travelled out to Poland. In 2009 there had been pleasure tinged with big, yet suppressed, annoyance, and lots more opportunity to turn on myself for having “failed” to get a medal. That was even despite our gold medal in the sprint relay a couple of days afterwards. This time around, for the me of 2015, there was joy. Apologies to those to whom I spoke in the hours after that race in Torun. I was on the verge of tears of pure pleasure each time. My face hurt from the smiles as much as my legs hurt from the races, by the time I got back to my hotel. No beating myself up, no raking over the past training schedules for evidence of inadequacies. I’d rediscovered what makes a 61 year old man who has basically been a sprinter all his life carry on doing it. Fun. Pure, unalloyed FUN. I was not ” a better person” for success (such as it was) in Torun, just as I came to learn that “failure” (such as it seemed back then) in Lahti didn’t label me “a bad person”, except in a mind that had made itself literally ill with the unrealistic expectations it had stacked up. The me of July 2009 didn’t understand that. Depression is not about being “a bit sad” etc. It’s an illness that will eat you whole until you confront it and ask for help. I did, when the alternatives became unthinkable. To those who helped, my delight at what I achieved in Poland last week is for you to share. Some of you will be reading this. You know who you are. Thank you. Oh, and on the day after that 200 metres final, I led off a 4 x 200 metres relay squad that won a gold medal by a big margin. 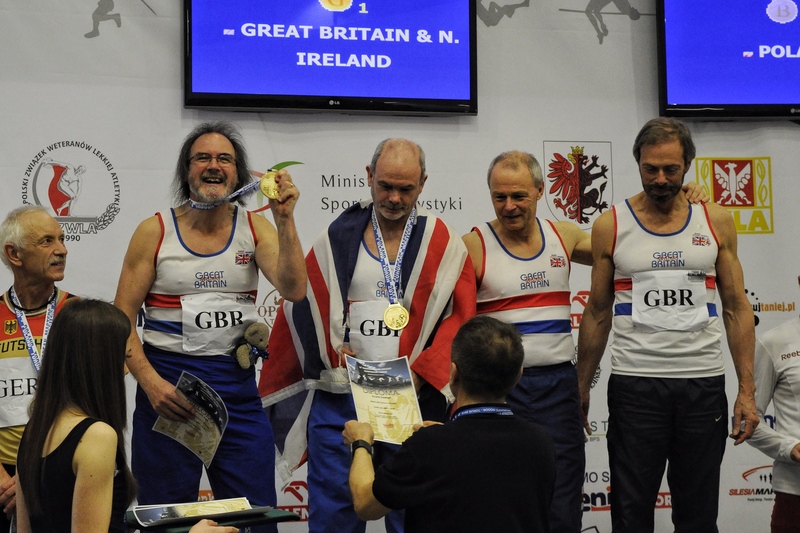 A number of friends commented that I seemed a bit happy on the presentation rostrum when we got that medal. Perhaps this blog goes some way to explaining. Hat tip to Joni Michell for the title of this blog. The reason I used it might be obvious, but in addition, you need to know that 200 metres indoors is raced as one lap of the track. As I write, Joni is, sadly, very ill in a Los Angeles hospital. I’ve avoided blogging here for the few weeks that have represented my domestic indoor athletics season this year. I really didn’t want to tempt fate. My plan only included six (eventually seven) races spread across three meetings. I couldn’t afford to screw up, or my plans to race in Poland at the end of March at the European Masters Championships might have been derailed. By leaving out the open-graded sprint meets I occasionally do, I was basing my season around three championship events – three in just four weekends. Well, first a bit of a recap. My damaged wrist screwed any chance of the strength-based autumn I’d planned. My emphasis therefore had to change to favouring aerobic fitness (which is where the Maidstone Parkrun fitted in), over which I hoped to layer some slightly more sprint-related work in the second half of the winter. I miscalculated a bit. That “second half” was quite short, because my scheduled indoor races began in February. First discovery was that my sprint starting and pick-up phase was good. Certainly better than I’d expected. My regular focus in the gym on building fast leg-speed clearly played a part here. Several times, I’ve been leading a 60 metres race up to 40 metres, only being overhauled at the close, when this winter’s missing ingredient – strength work to help me maintain full speed – began to take its toll. Nevertheless, I’ve come within a mere 5/100ths of a second of the target 60 metres time I’d set myself for this winter. That target was the same as my fastest race last winter. I figured that a year on, a year older, etc, matching it would actually represent a bit of a stretch target, given how my winter’s training had actually panned out. Racing 200 metres events has been a bit of a different story. Sure, I’m getting up to full speed quickly, and relaxing into top gear quite well. But better aerobic fitness notwithstanding, it begins to go a bit downhill from the point at which there is a fine balance between sprinting hard to the finish and simply preventing lactic acid from slowing you down. Put simply, in these races too, I’m being passed by guys able to hold high speed for longer than me. My conclusion is that much of the aerobic work I did in the winter (Parkrun included) just wasn’t at a sufficient speed to address this. That’s to say, despite the suffering involved, steady 5k runs should have given way to 250 and 300 metre repetitions at a high percentage of race pace rather earlier on. The watch agrees. I’ve been disappointed with my 200 metres times – even though I have just won a bronze medal at the British Masters Championships. Now the focus is on Poland. At time of writing, I have two weeks to find some speed endurance. Probably not enough time, because speed endurance work hurts and is tiring, and I don’t want to arrive at the European Championships tired out from training for them. Therefore, I think I’m locked into sharpening up even more on the things that are going well, in the hope that they can provide an even better cushion and camouflage for the weak spots. I’ll blog again after Poland and let you know. Wish me luck! You are currently browsing the Blog from a Faster Master blog archives for March, 2015.